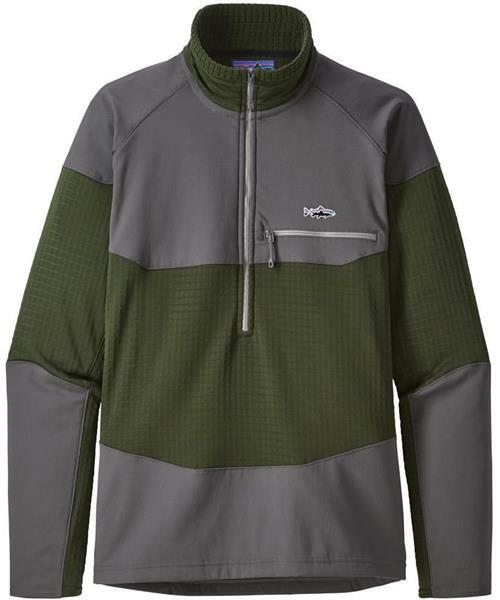 Made with lightweight, fast-wicking 6.3-oz Polartec® Power Grid® 93% recycled polyester/7% spandex fleece that provides comfort and insulation across a wide range of temperatures, the Long-Sleeved R1® Fitz Roy 1/4 Zip moves with you while taking the chill out of cold morning air. The built-in stretch offers excellent freedom of movement when you’re on the trail, at the oars or swinging flies. The shoulders, forearms and hem are reinforced with 96% nylon/4% spandex for enhanced durability and have a DWR (durable water repellent) finish to ward off light showers or dew-soaked vegetation. The single left-chest pocket is zippered for security, and when the day finally warms, the shirt compresses for easy packability. Our iconic Fitz Roy Trout logo is featured on the left chest. Fair Trade Certified™ sewn.